The Texas Longhorns played 61 games in 2009 before their trip to the College World Series. In those games they hit a total of 39 home runs, but Omaha was much more agreeable to Augie Garrido’s squad. After averaging just .63 home runs a game in those 61 contents the Longhorns exploded for 14 longballs in their six games at Rosenblatt Stadium – an average of 2.3 a game. What caused the sudden surge? Russell Moldenhauer led Texas with 4 HR and a 1.000 Slg.% at the CWS. Texas DH Russell Moldenhauer’s explanation was simple “We’re not playing at Disch-Falk (the Longhorn’s home field),” Moldenhauer said after belting a pair of solo shots in UT’s 7-6 loss to LSU in game one of the CWS Championship Series. 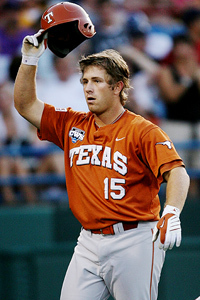 Moldenhauer led Texas with 4 solo HR in his six games in Omaha after totaling just 15 hits in 38 games in 2009 prior to the College World Series (he was inured for much of the season). The Longhorns needed every longball they could muster in Omaha. They scored 17 of their 36 runs at the CWS courtesy of home runs (12 of the 14 shots were solo,) Texas had just a .413 slugging percentage going into the College World Series, but they slugged at a .537 clip in their six games at Rosenblatt. The home runs, along with a CWS-best 4.02 ERA in their six games, helped them overcome a.258 2-out batting average and .373 on-base percentage in Omaha. Their 2-out average ranked 6th in the eight team CWS field, while the OBP was last. However, only LSU’s .555 slugging percentage was better than Texas’ .537. It’s also quite ironic that the team that led the nation with 104 sacrifice bunts (including an NCAA Tournament record with seven in a Super Regional game vs. TCU) in 2009 while hitting just a total of 53 home runs had more homers than any other team at the CWS. LSU was second with 13 Omaha home runs, but the other six College World Series participants managed a combined 18 HR in a total of 19 games at Rosenblatt. Neither Brandon Belt nor Brandon Loy homered in Omaha, but they had 3 and 4 RBIs respectively. Loy led the nation with 25 sac bunts in 2009, but he had just one in 6 games in Omaha. Belt had 11 sac bunts in ’09, including two at the CWS.